Despite the name, this beautiful town on Bolivia’s side of Lake Titicaca has no relation to the Barry Manilow song. But living here would certainly be a good excuse for having dancing feet. 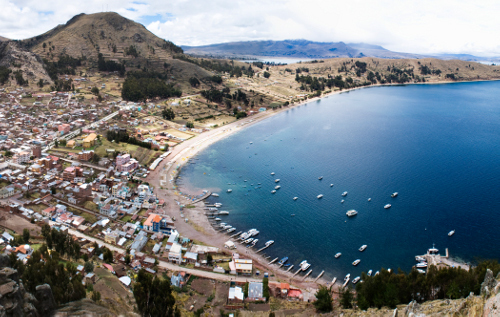 Copacabana is actually Bolivia’s largest town and port on Lake Titicaca, and it’s where you can catch a boat to most of the lake’s majestic, mythical islands — like the sacred Incan island of Isla del Sol. In fact, while Copacabana is a prime destination for tourists visiting the country, it also has a local, spiritual element that’s unique and pristine. For instance, the town is where you’ll find the famous Basilica of Our Lady of Copacabana, home of the Virgin of Copacabana, the patron saint of Bolivia. And Copacabana’s religious celebrations, cultural patrimony, and traditional festivals are well known throughout Bolivia. In fact, the location had religious significance long before the Spanish conquest; once home to an Andean temple dedicated to Kotakawana, a fertility god. Once visiting here, it’s easy to see why it has been so spiritually revered. The lake alone is impressive; the largest in South America, and from its perch high atop the Andes at over 12,000 ft, it is one of the highest commercially navigable lakes in the world. The altitude is also good for the body and light for the head. Today the town has a comfortable 6,000 residents, and aside from being right on the lake, there are the surrounding Andes to explore, not to mention countless ancient Incan ruins. Many of the lake’s islands have their own distinct populations and cultures, which can make exploring them seem like you’ve stepped into another land. And there are few places in the world where you’ll get more bang for your buck than in Bolivia, making it one of the cheapest and increasingly popular destinations for expatriates. If you’re looking to move to South America, you could do much worse than Copacabana!